In January 2005, a three-alarm fire ravaged the 1834 John Howland Jr. House located at 38 South Sixth Street in New Bedford, just south of downtown. For five years, the house had been exposed to the elements causing severe deterioration and in 2009 it was slated for demolition. Recognizing the architectural and historical significance of the Howland House and that WHALE was the only alternative to demolition, WHALE began to prepare strategies to save the historic treasure.In April 2010 WHALE, in partnership with the City of New Bedford, saved the 1834 John Howland Jr. house by purchasing the structurally unsound building from its previous owners for $237,000. Acquisition funds came from WHALE’s Neighborhood Restoration Revolving Fund and a $100k grant from the MA Historical Commission. 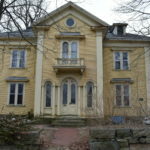 The rare, brick mansion has strong ties to the Howland family, a prominent New Bedford family, and our whaling history. 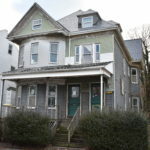 WHALE raised the funds necessary to stabilize the property, including constructing a new roof, putting back the original roofline seen in historic photos. Architect Kit Wise prepared architectural plans to develop the building into 5affordable and 2 market two bedroom apartments, with one 3 bedroom on the top floor. WHALE has partnered with the non-profit developer TRI, Inc. to construct the property. TRI recently purchased the property and will be managing the apartments when it is complete. Historic Significance: A Contributing building in the County Street National Register Historic District that was built in 1834 for John and Sarah Howland Jr. 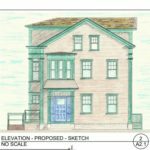 The house is an Exceptional example of transitional Federal/Greek Revival style architecture and the substantial wealth that was made in the whaling industry in New Bedford. One of a complex of three remarkable and extremely rare brick mansions built for the New Bedford, John Howland Jr. partnered with his brother James in “J&J Howland Merchants” on Middle Street and he was one of fifteen original trustees of the New Bedford Institution for Savings. The Howland family, unlike many of their Quaker counterparts who built their mansions and ostentatious homes on the main thoroughfare of County Street, chose to build their grand mansions and fine homes on Sixth Street.